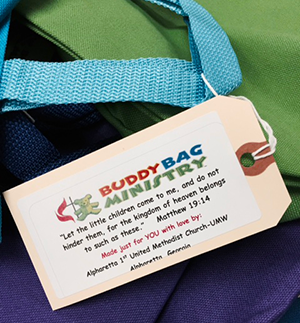 The mission of AFUMC’s Buddy Bag Ministry is to share Christ’s love with children in crisis by providing them with comforting Buddy Bags. 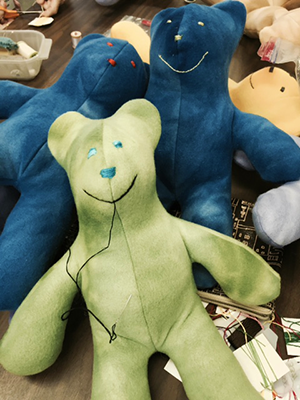 A Buddy Bag is a canvas bag containing a hand-made Teddy bear, a blanket from the Blanket Ministry, a book, crayons, drawing paper in a pocket folder and an activity/coloring book. The bags are provided to children (infant-teens) in the midst of a crisis — family distress, fire, hospitalization, etc. Items can be placed in the Buddy Bag bin in the entry area of Trinity Hall. Buddy Bags exist because of you and your generosity. We are funded solely by your donations. Financial contributes to purchase additional supplies are appreciated. Please make checks to AFUMC and designate “Buddy Bags” on the memo line. Volunteers are needed on Tuesdays during the school year, 9:30 a.m. to noon. If you’d like to volunteer, contact Pamela Schiftic. If you know of a child in crisis who needs a Buddy Bag, please contact Mary Morgan or the church office (770-475-5576).